Faceted beads — are a cost-effective and lightweight alternative to crystal beads. Available in various sizes and a wide range of colors, both in opaque and translucent, you can create different types of wonderful and unique patterns on the collar of your clothes. Apart from using them on the collars of clothes, you can even add them to other parts of clothing such as sleeves and even add them to bags and other accessories. Their multi-purpose use is exactly why they have gained popularity in recent times and is widely used among clothing designers. Over the years, USA Beading has witnessed the increasing popularity of faceted beads having placed them on the clothes of several designers with the collar becoming the favorite place for adding these beads. You cannot see through opaque faceted beads whereas you can through translucent faceted beads. Whether you decide to use opaque faceted beads or translucent faceted beads, you will have a lot of colors to choose from such as purple, orange, white, pink, red, blue, and many more. Our domestic beading service provides you with access to a diverse range of colors to choose from. We can provide you with a list of colors that we have, and you can pick and choose from there. This allows you to easily choose a color that perfectly complements the color of the material. You can fill the entire collar with faceted beads, or you can add beads to the outside of the collar, leaving the middle empty. You can even add large and small beads on the collar or change it up by mixing two to three different colors. You can add beads to an unconventional collar such as a curved one or one made from a different type of fabric such as lace. 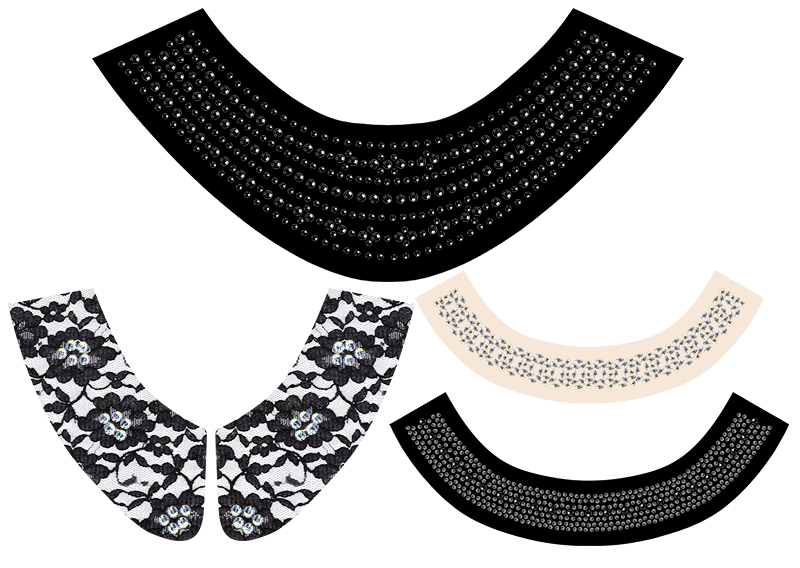 You can embellish the collar with faceted beads in such a way that it looks as if the person is wearing a necklace. You can even place the beads close to each other on the bottom of the two sides of the collar in a pattern such as a circle. Since our domestic fabric decorating company has faceted beads available in various sizes, you can even use the smallest beads to create a star pattern for instance. You can create a host of patterns using these beads, so let your imagination run wild. So what are you waiting for? We are waiting for you to contact us. USA Beading cannot wait to embellish the collars of your designs with faceted beads. If you are running out of inspiration, you’d better call us. Our experts can even guide you with making the right decision when it comes to choosing the type of bead to place on a design, the colors to choose, and the patterns to create. We are pros at what we do. With us, there is no lengthy wait on when you will receive your beaded clothes. We provide a fast turnaround time because we are based in New Jersey. Get in touch with us today, and let’s talk about faceted beads.